UFC as a sport is probably the closest thing we’ll ever get to a real-life fighting game. In fact, I don’t think most fighting games are anywhere near as brutal as UFC is, unless you include Mortal Kombat. Being a huge fan of fighting games, I was really looking forward to experiencing what UFC 3 had to offer. Having only played UFC for a handful of hours mashing buttons against my brothers, learning how to play properly, creating my own fighter and actually winning some matches based on skill rather than luck was an attractive prospect. As a relatively new UFC player, I found the Create-A-Fighter system to be incredible in this game. Utilising EA Sports Game Face and the rest of the in-game tools, players can create the characters of their dreams. Returning players may be disappointed to find the system is very similar to the one in UFC 2, though if it ain’t broke, don’t fix it. I know firsthand you can make some horrifying creatures like my Career Mode warrior, Gemeniah Gaff. Career Mode sees your custom character rise through the ranks as an unknown fighter in the World Fighting Alliance to become the G.O.A.T (Greatest of All Time) in the UFC. The presentation of the Career Mode is exactly what you would expect from an EA Sports game, which is to say it looks an awful lot like a UFC event on television. There are parts of the Career Mode that feel like they should’ve been interactive. Throughout your career, players have the option to increase their stats, train at the gym to learn new moves and promote an upcoming fight. The only time you have any interaction with these three options is when you are forced to complete a task when learning new moves. I can understand why the developers would choose to make the training routines for stat points something you can do quickly, but promoting fights really should have included some interactivity. There are moments where you are at a press conference in the build-up to a major fight, however this moment only lasts for a few seconds as you briefly watch your character in a cutscene. As your character’s career progresses, rivalries will begin to form. 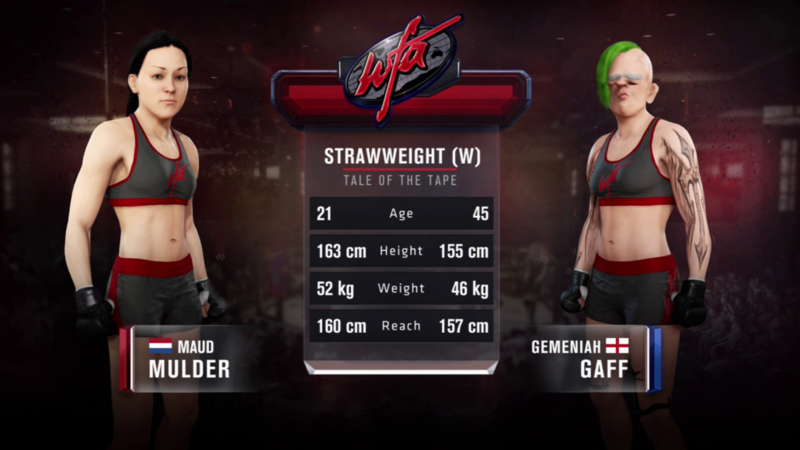 These rivals can be fighters who have made their way up the career ladder alongside you or even fighters that are looking to intimidate the newcomers. Upon my first playthrough I assumed these rivalries were completely random, but I soon learned that they are all scripted, ruining any replay value from the Career Mode. I’m so confused by this decision as the rivals don’t do or say anything unique. There are no cutscenes where your rivals have any voice lines, everything they have to say is through text bubbles. There’s no reason as to why the rival characters couldn’t have been randomized or even cycled through predetermined fighters. During my first playthrough of Career Mode, I thought I didn’t understand the ground game mechanics as my transitions in the later fights would almost always get blocked. After playing online against humans, I soon discovered the AI near the end of Career Mode are almost unbeatable on the ground. In addition to this, the AI will unexpectedly go against a fighter’s style if it needs to. Conor McGregor should not be attempting several takedowns in a fight, that just doesn’t happen in real life and yet it does in UFC 3. UFC 3 is not an easy game to pick up and play, which is why it would’ve been nice to have a story mode similar to The Journey in FIFA and Madden NFL’s Longshot mode. The story modes in both of these games are a great way to introduce players to the complex controls and mechanics. 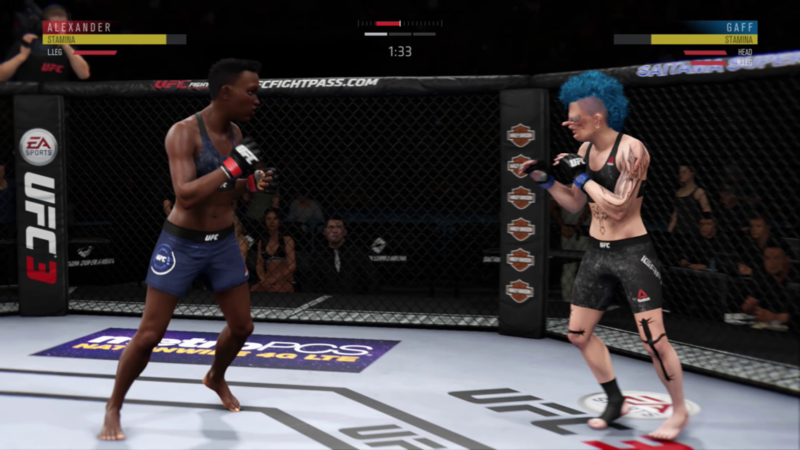 The Career Mode in UFC 3 doesn’t make any effort to teach players how to play the game, it assumes you know exactly what to do once you step inside the cage. Submissions are incredibly frustrating for new players, especially those that aren’t familiar with UFC in any form. It’s expected that there would be a learning curve when learning brand new mechanics, but the entire ground game aspect of UFC 3 takes this frustration to another level. EA needs to do more to teach new players because the current set of guides and tutorials aren’t good enough. I understand the appeal of Ultimate Team in other sports games but I really don’t get it in UFC. In a game like FIFA, players can build their dream squads with footballers that have never played together. 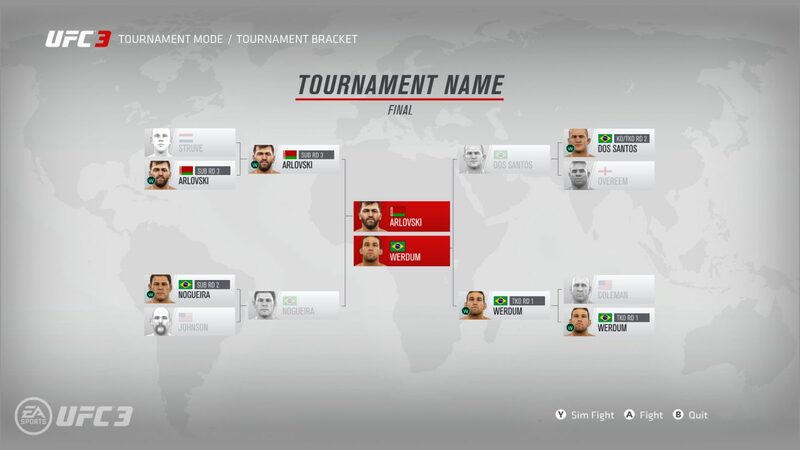 In UFC 3, players are supposed to construct their Ultimate Team roster using fighters from Lightweight, Middleweight, Heavyweight, and Women’s Bantamweight classes. Just like every Ultimate Team mode, players will need to open as many card packs as possible in order to gain an advantage. The card packs contain fighters, unique fighting moves and stat boosts for your team. You also have the option of using custom fighters in Ultimate Team, but be prepared to fight against real fighters. What’s the appeal of playing with individual fighters you already have access to? If you refuse to pay for more packs, you’ll have to grind matches against the AI which can be tedious. Maybe you have deep pockets and you want to assert your dominance by obtaining the best fighters with the most powerful stat boosts… other than that, I see no reason why anyone would bother with UFC 3’s Ultimate Team mode. A large portion of the new multiplayer modes is restricted to local play only. This is unfortunate as these modes change up the gameplay significantly, makes a nice change from the regular fighting mode. Stand & Bang (all strikes, no ground game) and Submission Shootout (all ground game) are great ways to introduce separate mechanics to players without overwhelming them. Knockout Mode makes a return from the previous game, turning UFC 3 into a traditional fighting game featuring health bars and no ground game. There’s also Tournament Mode where players take on each other in bracket-style elimination rounds. It’s a great way to see who truly is the best at UFC 3 amongst a group of friends. I have an issue with the replay system whereby it only shows the final knockout blow or submission. I’m unsure as to why you can’t watch other highlights throughout the game despite the rounds being relatively short. In addition, it would be nice to have access to the camera during the replay instead of having preset angles to view knockouts from. It seems strange that almost every other EA Sports game has this feature except the UFC series. The performance of UFC 3 on the Xbox One X has been great. I haven’t had any problems mid-game, playing almost exclusively on Performance mode (1080p visuals at 60fps). I have read some issues online regarding the PlayStation 4 Pro version which sometimes freezes for a few frames in the middle of matches, that is something I have not come across on the Xbox One X version. The Visual mode looks nice at 4K, though I would never choose it over the Performance mode due to the low frame rate. UFC 3 still looks great in Performance mode, and if you are playing a fighting game like this then you will want as high of a frame rate as you can possibly get. Judging by what I’ve seen online, the definitive version of UFC 3 is on the Xbox One X. Reviewed on Xbox One X (code provided by the publisher). You may purchase the game on Amazon.